India's second talking automated teller machine for the visually-challenged was installed in Dehradun, Uttarakhand, to help them to perform their banking work independently. The machine, installed on the premises of National Institute for the Orthopedically Handicapped, works on the basis of fingerprint identification system and has customised keypads to make money transactions easier. "In this, they don't have to put in any password; it works on the basis of their fingerprints. 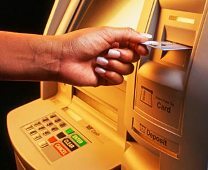 The bank scans their fingerprints and on that basis they can withdraw money from ATM," said Pramod Khanna, manager of the Punjab National Bank. Sajji Mathews, a visually-challenged person said that the newly set up audio-aided ATM would help in making such people independent. "This will benefit us in many ways. Now we can do our banking work independently. Earlier we used to need help of a sighted person to help us fill forms and submit the forms. The major problem that we would often face was that our signatures didn't match many times. This used to cause a lot of problem for us, but today we can withdraw money whenever we want," said Mathews. ICICI Bank was the first one to set up the first automated teller machine for the visually impaired in Pune in August 2002.